With just a few hours of 2011 remaining in Mountain View, Calif., we’re taking our traditional look at the past year on the Official Google Blog, as well as Google’s presence on Google+ and Twitter. Introducing the Google+ project: real-life sharing, rethought for the web – 909,537 unique pageviews. In June, we launched Google+ to bring the nuance and richness of real-life sharing to the web. Microsoft’s Bing uses Google search results—and denies it – 538,764 unique pageviews. We posted about how our experiments determined that Bing was using Google web search results. Supercharging Android: Google to acquire Motorola Mobility – 431,366 unique pageviews. In August we announced an agreement to acquire Motorola. Evolving the Google design and experience – 352,254 unique pageviews. We began to bring greater consistency to the Google experience, revamping first the homepage, then Gmail and more. Games in Google+: fun that fits your schedule – 265,995 unique pageviews. Less than two months after we launched the Google+ project, we brought games to the platform. More wood behind fewer arrows – 310,912 unique pageviews. As part of the process of prioritizing our product efforts, we announced the winding down of Google Labs. Advanced sign-in security for your Google account – 281,385 unique pageviews. It’s not often we can say that a post about online security is one of the top posts of the year. 2-step verification, an opt-in feature that helps verify that you’re the real owner of your account, was an exception. Google+ Pages: connect with all the things you care about – 237,467 unique pageviews. The third most popular Google+ post on the blog was about pages for brands and businesses to connect with people on Google+. Finding more high-quality sites in search – 258,974 unique pageviews. A major change to our ranking algorithm, known as Panda, is aimed at helping people find even higher quality in our search results. Other popular posts included the announcement that Larry Page was becoming CEO, a project to help Egyptians communicate during the January protests, Google+ updates and +1 news, a keeping your information safe from phishing campaigns, patents and Android, practical steps toward greener computing, more search news and the debut of Google Wallet. We shared special doodles (from Lucy to Les Paul to the lunar eclipse, and Jules Verne to Jim Henson) and stories from unique Google users. We brought music to the cloud, Ice Cream Sandwich to your pocket, and great works of art and pieces of history to your computer screens. We worked to help those affected by disasters in Japan and elsewhere, told some history tales, and, as always, had some fun along the way. Like many of you, we were excited to start using Google+ Pages when they launched in November. We’re now running 22 pages for Google products and teams; nearly 100,000 of you have the flagship page, +Google, in your circles. Popular posts there include photos of our L.A. office, holiday, New Year and Marie Curie doodles, the year-end Zeitgeist, Google Photography Prize and Sebastian Thrun on self-driving cars. We’ll soon celebrate @google’s third anniversary on Twitter, and we hit the 4 million follower mark this month. Popular tweets include the Les Paul doodle, patents and Android, Motorola, Larry and Sergey remembering Steve Jobs, Google Wallet, Google+ and Wael Ghonim. As the clock ticks toward the close of 2011, we thank our readers for following along—by feed reader, phone app or however you please—and hope you join us for the next year of Google news. Happy 2012! Today, on Cyber Monday—the biggest online shopping day of the year—digi-savvy shoppers will take to the web to get ahead on their holiday shopping. You’ve managed to avoid the Black Friday crowds, but are your online shopping skills up to snuff? Just in the nick of time, here are five tips on how to use Google tools to save time and money this holiday shopping season. Today we’re announcing a version of Google Catalogs for Android tablets, available for free in Android Market. 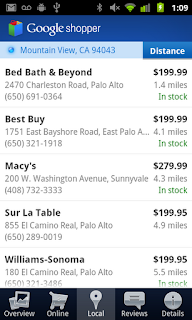 Now shoppers can browse Google Catalogs on both iOS and Android tablets. With over 125 of your favorite brands and 400 issues across a myriad of categories, Google Catalogs puts all your favorite print catalogs right at your fingertips. 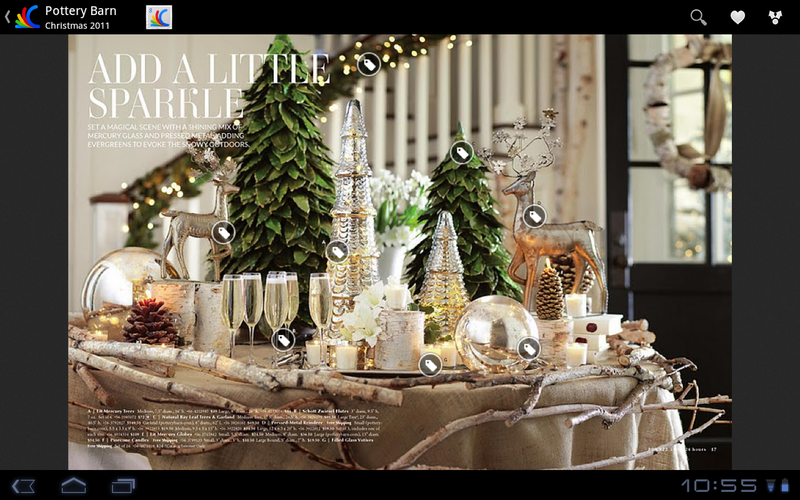 You’ll find pages of gift and decorating ideas and get a head start on your holiday shopping list. Browse Pottery Barn’s Christmas 2011 catalog on Google Catalogs – now available for Android tablets. With so many brands, models and features to choose from, sometimes finding the perfect gift—especially when it comes to electronics and gadgets—can be overwhelming. Google Product Search gives you detailed product information, reviews and price comparisons for all the gifts on your list. We recently launched a new comparison feature for electronics that lets you quickly see how a particular product stacks up against other similar models and brands. 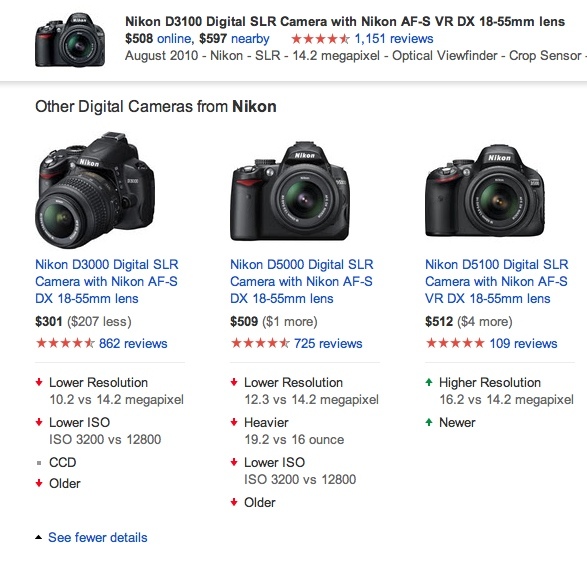 For example, on the Nikon D3100 product page, you can now see—at a glance—feature comparisons between the D3100 and other Nikon models as well as cameras from other brands. Read more about other recent Product Search updates on the Google Commerce blog. A quick comparison shows the differences in resolution and other camera features. Have you ever found yourself standing in a store, trying to decide between, say, two blenders, and wishing you could consult an expert? Google Shopper can help. 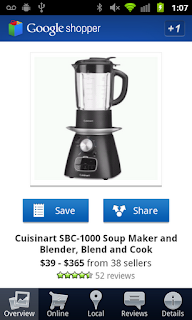 Wherever you are, this free mobile app for Android and iPhone lets you scan a barcode or search by voice or text to get detailed product information, read reviews and compare prices online and at local stores. You can also use Google Shopper to see if a product is in stock nearby. 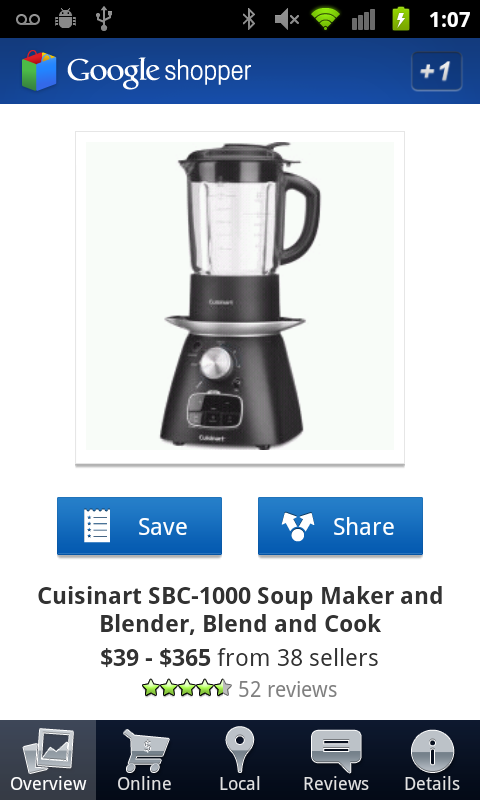 Research, share and find products near you with Google Shopper. Before you hit main street for a shopping extravaganza, check out Google Offers for great deals and save 50% or more on local places to eat, shop and play. Google Offers has teamed up with a number of great retailers this holiday season, making it easy to save while you shop. 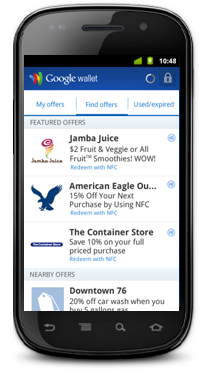 You can also find and buy great deals from Google Offers with the free Android app. Save time and money by shopping with Google Wallet — a smart, virtual wallet that stores your payment cards, offers and more on your phone and online. When you shop with merchants that accept Google Wallet online just use your Google Wallet username and password to complete your purchase—there’s no need to pull out your credit card or enter your shipping address with every transaction. If you’re at the register at stores like American Eagle, Macy’s, Gap, Inc or any of our other merchant partners, take a minute to try the Google Wallet app, available on Nexus S 4G for Sprint, to tap, pay and save. I hope these tips and Google tools help to make your shopping experience a little easier (and fun!) this Cyber Monday, and throughout the holiday season. 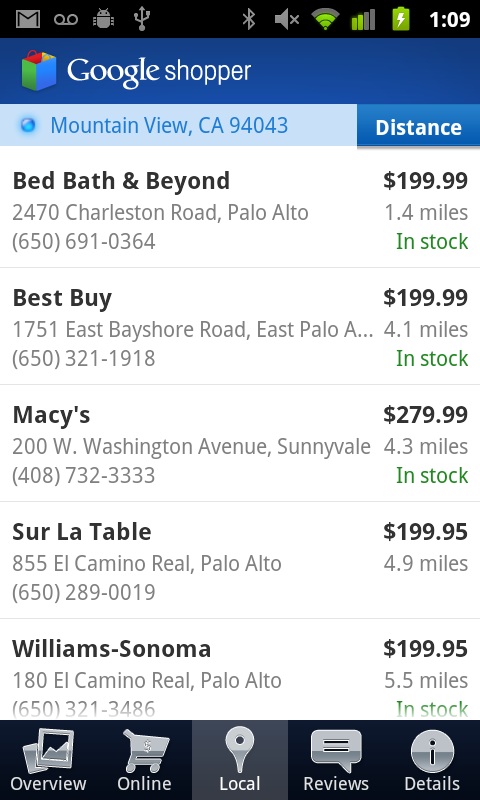 More Google Wallet merchants are live. Now you can pay AND save in a single tap. We’re hearing from people at check-out counters throughout the country that paying with your phone is a little like magic. Just look at the ecstatic reaction on the faces of our friends who made their first Google Wallet purchases last Thursday. Today, our partners American Eagle Outfitters, The Container Store, Foot Locker, Guess, Jamba Juice, Macy’s, OfficeMax and Toys“R”Us are rolling out an even better Google Wallet experience. For the first time ever in the U.S., at these select stores, you can not only pay but also redeem coupons and/or earn rewards points—all with a single tap of your phone. This is what we call the Google Wallet SingleTap experience. With Google Wallet in hand, you can walk into a Jamba Juice, American Eagle Outfitters or any other partner store. Once you’ve ordered that Razzmatazz smoothie or found the right color Slim Jean, head straight to the cashier and tap your phone to pay and save—that’s it. You don’t have to shuffle around to find the right coupon to scan or rewards card to stamp because it all happens in the blink of an eye. The Offers tab in Google Wallet has been updated to include a new “Featured Offers” section with discounts that are exclusive to Google Wallet. Today, these include 15% off at American Eagle Outfitters, 10% off at The Container Store, 15% off at Macy’s and an all-fruit smoothie for $2 at Jamba Juice. There are many more Google Wallet exclusive discounts to come, and you can save your favorites in Google Wallet so they’ll be automatically applied to your bill when you check out. Organizing loyalty cards in your wallet is getting easier too. Today, Foot Locker, Guess, OfficeMax and American Eagle Outfitters are providing loyalty cards for Google Wallet so you can rack up reward points automatically as you shop. More of these are on the way. Finally, a special thanks to Chevron, D’Agostino, Faber News Now, Gristedes Supermarkets and Pinkberry who are now also working to equip their stores to accept Google Wallet. It’s still early days for Google Wallet, but this is an important step in expanding the ecosystem of participating merchants to make shopping faster and easier in more places. If you’re a merchant and want to work with us to make shopping easier for your customers and connect with them in new ways, please sign up on the Google Wallet site. And if you’re a shopper and want to purchase a Nexus S 4G phone from Sprint with Google Wallet, visit this page. In May we announced Google Wallet—an app that makes your phone your wallet—with Citi, MasterCard, Sprint and First Data. With Google Wallet, you can tap, pay and save using your phone and near field communication (NFC). Google Wallet enables you to pay with your Citi MasterCard credit card and the Google Prepaid Card, which can be funded with any of your existing plastic credit cards. As a thanks to early adopters, we’re adding a $10 free bonus to the Google Prepaid Card if you set it up in Google Wallet before the end of the year. When we announced Google Wallet, we pledged a commitment to an open commerce ecosystem. We appreciate Citi and MasterCard for being our launch partners. And today, Visa, Discover and American Express have made available their NFC specifications that could enable their cards to be added to future versions of Google Wallet. This is still just the beginning, and while we’re excited about this first step, we look forward to bringing Google Wallet to more phones in the future. You can learn more about Google Wallet at google.com/wallet.